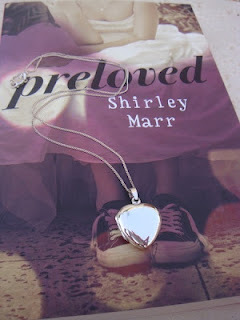 One of my favourite book blogs – The Midnight Garden – has a wonderful competition going: Win a copy of Aussie author Shirley Marr’s latest book Preloved -and- a beautiful locket. LET ME START BY SAYING THAT I AM one of Julie Anne Long’s fangirls. I absolutely adore the Pennyroyal Green series, and I have re-read all of my favourites, most recently “What I Did For a Duke”. So I have been waiting for the sixth instalment in this series with bated breath. Sadly, I have seen a lot of complaints in threads and in reviews that Ms. Long gets quite a few of the historical details wrong. As long as I don’t notice these things they do not bother me (though I don’t care to have them pointed out to me, to be honest, then they tend to annoy me). I can understand, however, that it would irk readers with a good knowledge of the time period (of which I am somewhat vague, but, again – that suits me fine). But I digress. Probably, because I am writing this review so reluctantly as I have to confess that I was fairly disappointed in this book. I cannot fault the writing – the sentences or dialogue never feel contrived or stilted and Ms. Long has such a wonderful way with words, that the prose is absolutely magical at times. Very few authors can evoke emotions the way she can. So I feel the anticipation/excitement/joy/passion/anguish and grief as her main characters do. In one scene, Phoebe’s beloved cat Charybdis is lost, and I suffer with her as she comes to face with the fact that he might be gone forever, and in the next scene I feel as frantic as Julian, the Marquess, as he hunts desperately to try and find the feline. The music twined around Phoebe, and in moments held her fast, in thrall. She yearned to know the next note, the next phrase. It was a fresh and delightful shock when each was lovelier than the next. Anticipation ramped and ramped. The voice slipped in almost unnoticed, like an interloper into a party. It insinuated itself between notes, and then surreptitiously, then ever more boldly, climbed, and climbed, and climbed . . . until it soared above the music. Brazen and glorious. Dear God . . . the sound of it . . . it hurt, hurt to hear, such was its beauty. She felt swollen with it. She reached out and clutched the marquess’s sleeve without realizing it. As if to prevent herself from launching skyward. “What is it? The song. Please tell me what it is,” she demanded on a whisper. He looked down at her hand. And then down into her face. If she had known his breath had caught when she’d reached out for him . . . if she had seen his expression . . . then she might have backed away, confused by the unguarded confusion and hunger there. Or she might have flung herself into his arms. She was owned by the music. She’d closed her eyes. However, I was not so happy about having to read about a cousin to the Redmonds. A not very likeable young lady at that, and she was not even the main female character. So in essence, even if the setting was Pennyroyal Green in Sussex and London, as per usual, and I met some of the beloved characters from earlier books in passing, the story was in not about a Redmond or an Eversea but about Phoebe Vale, a teacher at the academy for recalcitrant young girls and some totally unconnected Marquess. It turns out he is connected because he wants to marry the Redmond cousin Lisbeth, so that he can get land that once belonged to his family back in form of dowry. 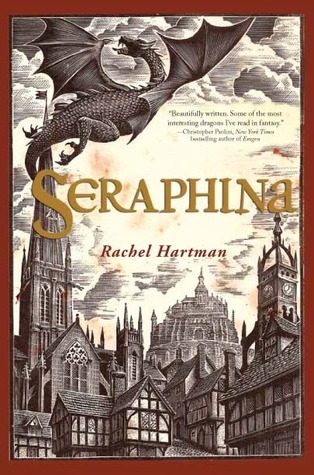 Another disappointment I have with this book, apart from not thinking that it is a true Pennyroyal Green-book, was that I felt there were some inconsistencies and a very forced obstacle to the HEA. Phoebe is planning to leave her employment at the academy to join a group of missionaires bound for Africa. At first this seems like a distant plan, apparently she has not saved up enough money. Then, suddenly because she wins some money in a card game, she is set to leave directly with the group of missionaries who are departing very conveniently in a very near future. Further, she does not seem to have anchored this idea of leaving with Ms. Endicott of the academy. He gestured to a case in a shadowy corner of the shop near the girls, far away from sunlight that could yellow or fade painted silk. “I hope you find something that pleases you.” Fat chance, Phoebe thought. That Fat chance thought felt so out of place that I had to look the expression up, and the first time it is recorded to have been used was in the early 1900’s. It felt more modern than that, though. And she slipped out of bed, and tiptoed across the carpet. She gave Charybdis a good morning kiss, then tiptoed across the carpet, collecting her gloves, her slippers.She tiptoes across the carpet. Twice. Sloppy. Rounding off this whiny review, I would like to say that the first part of the book was more enjoyable than the second part, which felt rushed and as mentioned, somewhat forced. Despite this, it was an enjoyable and addictive read and had my expectations not been so high, I probably would not have felt as let down as I admittedly do. I am now waiting to read about Lyon and Olivia. I think it is time. GoodReads Blurb: A husband, a family, a comfortable life: Theodora Lestrange lives in terror of it all. With a modest inheritance and the three gowns that comprise her entire wardrobe, Theodora leaves Edinburgh—and a disappointed suitor—far behind. She is bound for Rumania, where tales of vampires are still whispered, to visit an old friend and write the book that will bring her true independence. 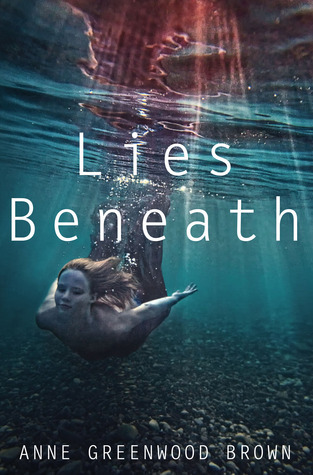 WE EMBARK UPON THIS STORY IN EDINBURGH, Scotland, in the mid 1800s. Theodora and her sister Anna grew up with their grandfather, Professor Lestrange. When Anna left to get married, Theodora missed her so much that her Granpa tried to comfort her by sending her to a school for young ladies in Bavaria. There, she made the acquaintance of Cosmina, a Romanian girl, who – just as this book begins – sends Theo a letter of invitation to her upcoming nuptials. 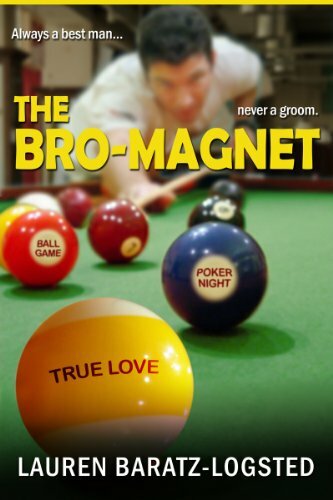 This solves things rather neatly for Theo, who is an aspiring author and is waiting/hoping/planning to write that big novel that will really launch her career and this invitation is also a reluctant relief for her brother-in-law who is temporarily saved from having to add her to his already financially strapped household. 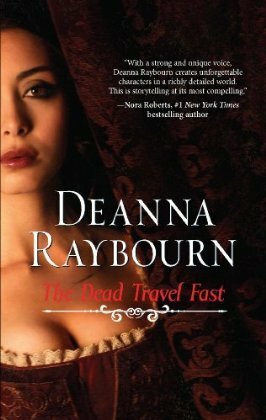 The Dead Travel Fast – now, doesn’t that title send your imagination in the direction of spooky dank castles, mysterious and darkly attractive counts and the walking undead? It did mine. 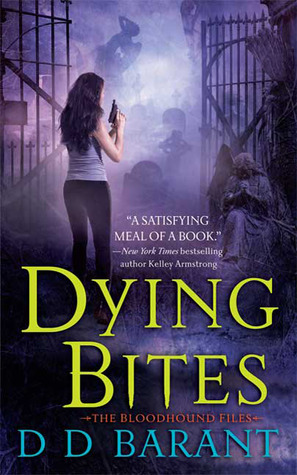 And the promise of the title was delivered to a point – it is dark in the corners of the falling-apart castle in the Carpathians that Theo travels to, there is a sense of foreboding and a nagging question – could there really be such things a strigoi – walking dead, feeding on the blood of the living? I had done right to come. This was a land of legend, and I knew I should find inspiration for a dozen novels here if I wished it. The wedding is off, Theo finds out upon her arrival. Cosmina begs her not to talk about it but to say she’s come for a visit. So Theo decides to spend some time with her friend. Get a start on her novel and enjoy the hospitality of the Countess of Dragulescu, Cosmina’s aunt and mother of the present count Andrei (Cosmina’s erstwhile fiancé). It does not take a genius to figure out that the count is the love interest of Theo. (I try to pretend I can’t see these things coming, in order to surprise myself, but I usually fail). Now Theo I find acceptable. I don’t take to her character completely; she is a bit too dry, too practical, comes across as a little too modern for these times and – let’s say it – a tad boring. As a reader, I never feel what she is feeling even though the book is told in first person from her point of view. The count, however, I find detestable. He is a selfish womaniser of the worst sort. I have sampled women the world over, from courte sans to countesses, and I can tell you there are only three types of women who matter in a man’s life – those he marries, those he seduces and those he takes. I have only to tailor my behaviour to become whatever the lady in question wants me to be and I am assured of success. Add to that a preference for opium and you have a user of a guy who does not think that your blood makes you worthy of marriage (even though he is quite happy to bonk you on the sofa in the observatory) and who smells of overripe fruit. The smell of opium clung to him, not unpleasant, but primeval, like windfallen fruit on freshly turned earth. There are strange going-ons in the castle and surrounding village. Some men are rumoured to have taken to the forests to live as wolves. The old, evil count is feared to have turned strigoi and started attacking those who were closest to him. Meanwhile, Theo has discussions on every type of topic with the count, who she is drawn to like a moth to a rotting fruit. She says that regardless of their physical attraction, it is his mind that draws him the most. I am sorry to reveal that, because I found the book too boring (not enough fast moving dead people for my taste), I had to skim the latter part of it. I wanted at least to find out what was going to happen – who dunnit and and how the romantic relationship would be resolved. And it was meh. I can’t describe it better than that. This is not a bad piece of writing, some of the historical and geographical details are really interesting. But as a romantic and/or goth novel it falls flat. It is not scary nor romantic enough and with an unlikeable hero the emotional investment was nada for me.